The last time I’d smiled this way it was because I’d just opened my eyes on the Paris metro to see a drunkard pointing a knife at my face. I’m not sure why the smile had popped out at that moment but it had worked a charm. The drunk had smiled back, shrugged and lowered his knife then stumbled off. Presumably to find less amused prey. This time, my quavering smile was matched by those of my two companions – Stacker, my partner, and Matcha Man, a designer from Dallas that we’d met at the St Oberholz Cafe. Our adversary was the stony-faced doorwoman at Berlin super-club Kater Holzig and she was effortlessly deflecting our triple-smile radiation. Any description of this petite woman in a quirky hat is going to sound less than intimidating so I won’t even attempt one. What I can say is that, somehow, she had all three of us quivering in our boots and grinning like hapless teenagers. I was particularly relieved though that, because of this, Stacker wasn’t making one of his usual bouncer-engraging facial expressions. Bouncers – or “”curators” if we were to use the term the doorman at Berghain, another Berlin super-club, prefers – often provoke this adverse reaction in Stacker since he hates being under the scrutiny of authority figures of any kind. The queue had been mercifully short when we’d arrived and we quickly arrived at the chopping block when both the couple and the group of three in front of us were unceremoniously turned away for no apparent reason. As we stepped up to receive our judgement, Matcha Man made a step a little too close to the entry line and she began menacingly sawing her neck at us. All three of us cranked our smiles up a notch and she glared at us and stalked off. Unsure of what to do, we were left waiting nervously for her return. 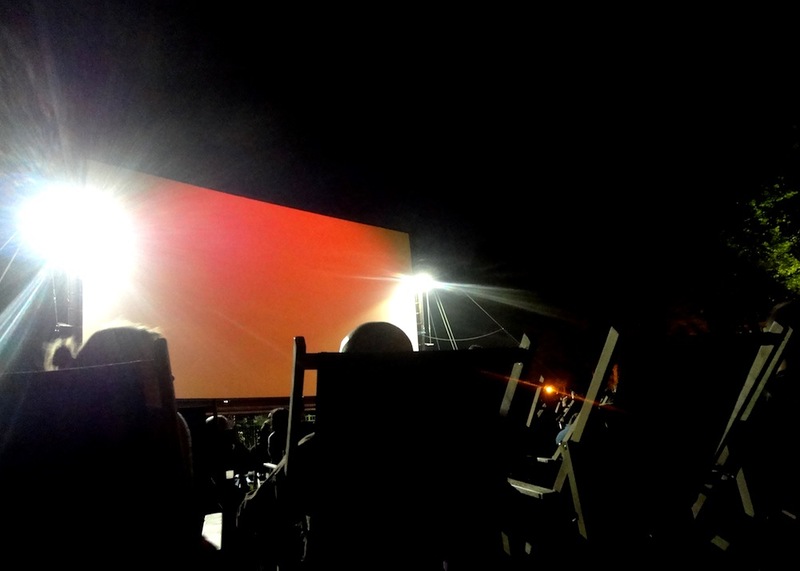 It had started like any other summer weeknight during which we’d gone out for tacos and a frozen margharita at Maria Bonita followed by a showing of Moonrise Kingdom at a freiluftkino – outdoor cinema – in Kreuzberg. Suddenly I was reminded of a time in London when someone had convinced me to go to Chinawhite, one of the city’s most exclusive clubs, on a normal day after work. Wearing scruffy work clothes and surrounded by leggy Russians and Rolexed financiers in the queue, I’d never felt less desire to enter a bar and had ended up slinking off. Matcha put paid to my fears pretty quickly though, assuring me that the Berlin clubbing dresscode is in fact diametrically opposite to London’s. “It’s just a playground for adults” he said. Buoyed up by the unexpected childish optimism of the film we’d just seen, the idea of a playground sounded pretty good and the idea of a club where Chinawhite’s standard patrons would be out of place sounded even better. And so we followed Matcha through the quiet streets to a wide dusty lot dotted with oil drums and ping pong tables. A giant red Beetljuice-esque arrow bearing the words “Kater” surrounded by white light bulbs was mounted high above us, pointing the way to the entrance. We didn’t know then the the double meaning of the word Kater in German, otherwise we may not have witlessly followed the big red “Hangover this way…” sign and found ourselves face-to-face with the most terrifying woman in existence. Around us the menacing brick buildings of an old soap factory towered above us, some of the windows bricked up, others illuminated in red or yellow and the façade artfully graffitied – an anarchist “A” symbol here, an abstract eye there and, dominating it all, a huge skeleton that was perhaps laughing, perhaps screaming. A large statue of a cat – significant because the other meaning of Kater Holzig is wooden tomcat – perched on one corner of the building. Various shacks styled as beach bars were scattered around in the space between the soap factory and the River Spree, which flows right past the club. Seemingly random objects were everywhere. A wagon wheel propped against a tree, a disco ball on top of a pole. Some – such as the lifesaver and ship’s wheel that adorned the beach bar – made sense but others were just bizarre, like the giant washing line – hung with t-shirts and undies – that swayed high above it all. Lights were carefully placed, lighting up various items and creating atmosphere. I wondered how it would look in the daytime but, while the club does stay open all weekend and some people actually party for multiple days, we lacked the youthful ability – and refused the synthetic help – to make it until daybreak. Matcha led us on a whistle-stop tour, pulling us through a corridor hung with vintage mirrors into a barn where a D.J. was playing then back out and over to a cluster of trees where some confessional booths were setup for those of us feeling the need to confess our sins or, more likely, for those looking for a dark and private spot. 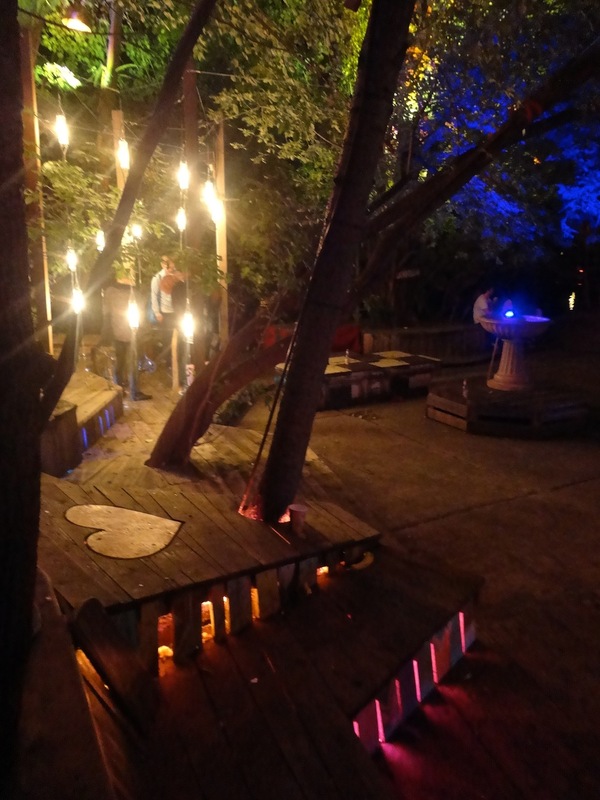 We scaled the uneven steps of a tall wooden platform to find sofas on top and then headed down to the river where people were sat around on the multiple levels of wooden platform by the riverbank, watching the water and taking a break from dancing. The smell of woodsmoke from the firepits tinged the air. Back at the factory building, we climbed up the concrete stairs to the terrace bar at the top. I swung from the swing hanging at the bar as we ordered a drink and checked out the view and an old brick factory chimney standing nearby – another relic of the area’s industrial past. On our way back down we investigated the factory’s dancefloors and all the nooks and crannies we could find, coming across unusual art or empty rooms. Outside again, we stopped to snap some cheesy photos in an old-school black-and-white photobooth, the kind where you have to wait five minutes for the still-wet photos to drop into the drying slot and inevitably smudge them because you can’t wait to see how they came out. Outside of the photobooth though, Kater Holzig maintains a strict no-photos policy. 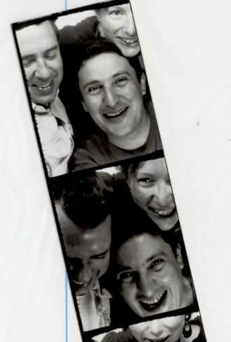 How many nomads can you fit in a photobooth? A sign at the entrance read No Photos but directly underneath it was another saying No Drugs and, well, since I saw plenty of drug-taking I figured why not take a few snaps…. Every inch of the club emanated the sort of gritty, bohemian-chic that is achieved by a great deal of effort going into making it seem like no effort was expended at all. It was a surprise then when we finally made our way to the toilets to find that they hadn’t been given the same treatment. What, no urban art hanging from the ceiling? No quirky pissoire? On the mens’ side, Stacker found himself politely asking two girls if they minded moving out of the way of the metal trough and was a little taken aback when one said that, yes, she did mind and refused to budge. Meanwhile, on the girls’ side, both stalls were occupied by pairs of girls administering their drugs of choice. As I waited, I caught sight of a spider, perfectly centred in a perfect web above one of the stalls. Finally two girls tumbled out one of the doors, shaking the wooden doorframe and startling the spider into doing a 360 on his web. I took my turn, rolling up my trousers to prevent them from dragging in the water (I hoped it was water) on the floor and squatting low over the toilet seat. Of course, with my luck, I’d ended up in the spider’s stall and so I also had to arch my back and crane my neck back to keep an eye on it while mentally repeating my anti-arachnophobia mantra spiders are beautiful, spiders are beautiful. I laughed to myself, thinking that this would be a great yoga pose and perhaps I would name it the Spider Watcher. As I came out of my pose to leave, I noticed the two-inch gap between the doorframe and the door and realised that everyone outside the cubicle could see me. Oh well – this is Berlin, I thought. Probably no-one even thought that doing the Spider Watcher while peeing was weird. Spotted at Kater Holzig: Proof that not everyone loves yoga.. 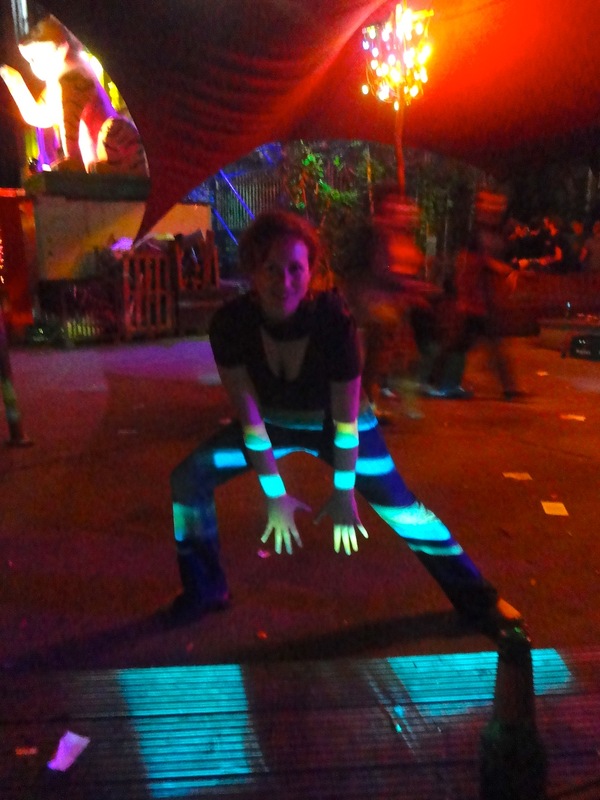 I scuttled off to rejoin Stacker and Matcha Man in the barn where we gave a few hours of dancing over to the D.J. before hitting the pizza shack to refuel. While a reheated slice topped with greasy pepperoni would have more than done the job at that point, that’s just not their style at Kater Holzig. They made our super-thin crust pizzas to order and baked them in a wood-fired oven while we watched, beers in hand. We sat on the uneven wooden steps by the river to munch on our pizzas. Noting the lack of any sort of barrier between us and the rippled dark water below us, I wondered how often people got drunk and tried to swim home. As it turns out getting home was pretty easy, a long line of taxis snaked its way up to the club as if at an airport or train station. The queue of people at the entrance had grown long and I felt acutely aware that we were leaving just as things were just getting started. It was 4am. Two weeks later though, thanks to Matcha Man’s expert persuasion again, we were back, this time on a weekend and this time the Smoke Room he had pointed out to us previously was open. True to its name, billows of smoke were spewing out of the open door. In the tiny space inside, a D.J was spinning tunes but he, and everyone else in the room, was completely obscured by the smoke coming from what must have been a glacier of dry ice. I immediately lost the group and all my bearings. I made a few tentative steps in and suddenly an arm holding a bottle of Jaegermeister emerged from the clouds. A brief clearing of the smoke and I saw the arm was attached to the bartender who was bent over the bar shouting something in Stacker’s ear. “It’s frozen!” she screamed, waving the bottle at him. I turned and went to explore in the other direction, finding the D.J and quickly reaching the wooden walls of the small shack. On my way back, I encountered a shot of red liquid, this time attached to Stacker’s arm. He tried to pass it to me but, without being able to see, instead gave it to a girl that had been standing next to me and whom I hadn’t even noticed until she’d reached out and tried to swipe my drink. Not that it would have mattered if she had – the Smoke Room had already disorientated me faster than any unidentified red liquid could. All of these carefully constructed parts of the adult’s playground that is Kater Holzig were happily lapped up by Stacker and I, but many who have been part of the Berlin clubbing scene for in the past decade take a more cynical view. 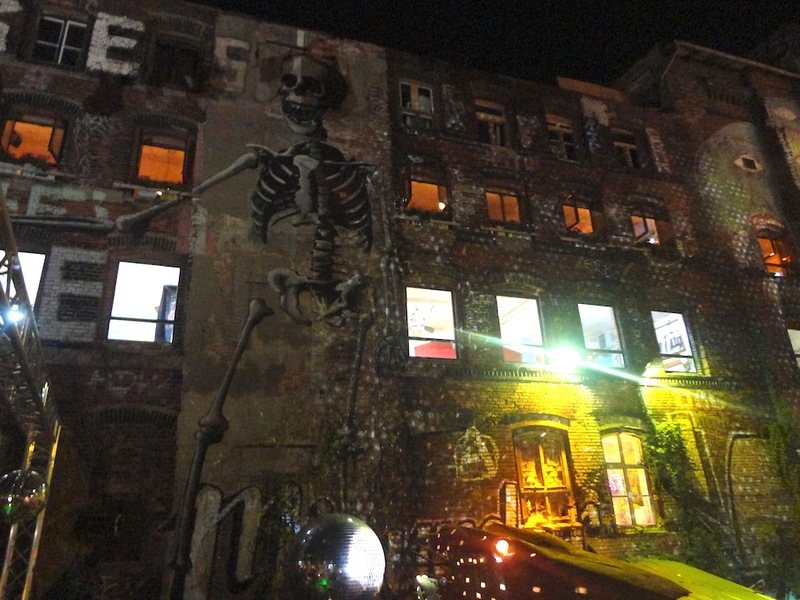 Shortly after the reunification of Berlin, a proliferation of artists’ squats and underground clubs began to occupy the many abandoned urban spaces in the city, forming the backbone of a subculture that Berlin became famous for. When the inevitable wave of gentrification flooded in, many of these places were washed away, and with them was Kater Holzig’s predecessor, Bar25. To many, Kater Holzig, and places like it, are simply trying too hard to recreate something that was real, replacing the bohemian with the fauxhemian and making a highly-monetised mockery of what was once a pure social experiment. They mourn the swallowing of a culture by the gaping jaws of capitalism and consider many of the echos of that era to be purely for the pleasure of the postmodern tourist. 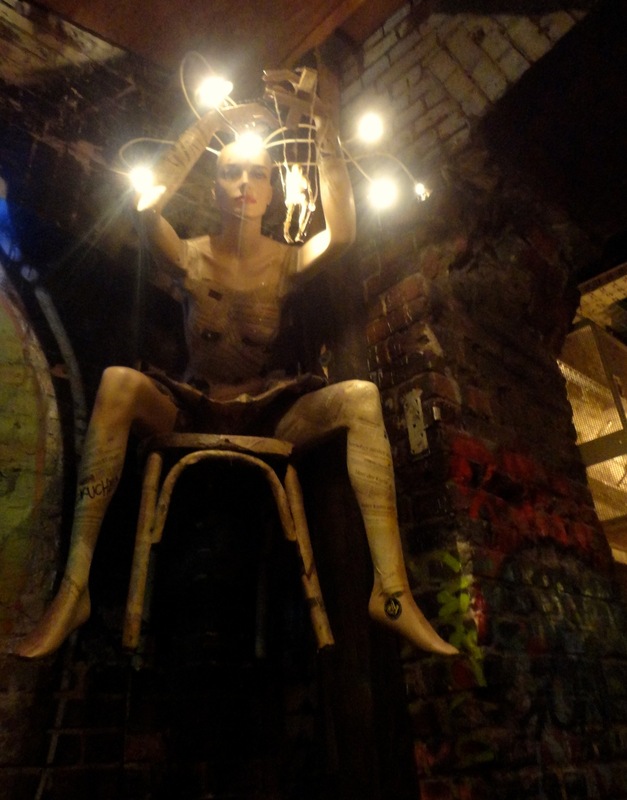 The legendary Bar25 that we’d heard so much about, started as a trailer in a vacant lot by the River Spree that was rented cheaply from the owner – Berlin’s municipal waste disposal company – by a group of friends. They partied through the summer and over winter hand-built a barn that was to become the focal point of the club that opened its doors in 2005. The fun, however was to be short-lived. With gentrification advancing and a city-backed plan to regenerate the waterfront underway, a more lucrative prospective tenant soon came along. In 2008, Bar25 was served with an eviction notice. They fought it and managed to cling on for another three summers – throwing legendary closing and then re-opening parties each year – but eventually they were forced to leave. One of the club’s owners claimed that its transience would actually be part of the beauty of Bar25, before promptly deciding to open a successor. Much was borrowed from Bar25 – a lot of the decor, the pizza oven and the bizarre door policy – but many claim that some of the spirit of Bar25 was lost along the way. Others, Matcha included, say Kater Holzig is a more polished iteration and, in many of its details, better than its precursor. I didn’t experience the legendary Berlin underground of the 90s or the hedonistic summers of the Bar25 era but they have clearly left a weighty legacy for those following in their wake. Indeed, I haven’t yet come across a club that is so steeped in politics, so much a microcosm of a city’s greater ills. But then again I haven’t come across a club quite like Kater Holzig. So lets not forget that this is an article about a club, a place of party, an adult’s playground. While there will always be those that prefer the past, we can rest assured that Berlin’s partying present is still quite firmly in a very special league of its own.